Use the RadDock built-in pop-up QuickNavigator to set the focus to any DockWindow or ToolWindow. Press Ctrl-Tab to open the navigation selector. Leave the Ctrl button depressed and press the Tab button to scroll through the names of the open DockWindows. If your current active DockWindow is DocumentWindow, pressing the Tab will scroll only through DocumentWindows; if the current active DockWindow is ToolWindow, pressing the Tab will scroll only through ToolWindows. 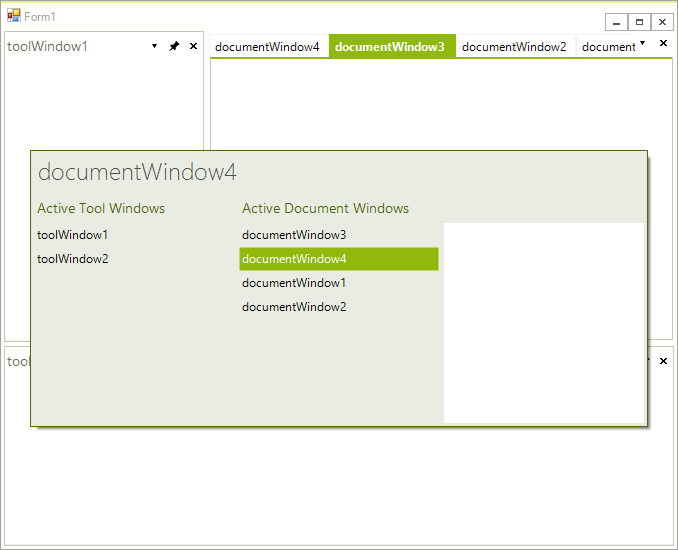 You can jump from DocumentWindows to ToolWindows and vise versa by using the mouse or by using the arrow keys.